I am excited to bring back the Get Ready for K Through Play series. This summer, I am being joined by 7 other bloggers and we will be sharing 6 weeks of posts centered around helping you get your child ready for kindergarten in fun, easy ways. This week we are focusing on Social and Emotional Readiness. Last year, I touched on these topics by sharing my top 5 Social Skills for Kindergarten Readiness and ideas on how to help your child Develop Kindergarten Language Skills. When parents think of Kindergarten Readiness they almost always focus on academic skills. While knowing the alphabet, being able to identify shapes and colors, count to 20 and being able to write their name are important and will greatly benefit your incoming kindergartener - to me, they actually aren't the most important things. In my experience as a teacher, what makes the biggest difference is a child's social and emotional development. They are able to learn and that makes a huge difference in the classroom. How can you nurture and encourage your child's social and emotional development so that they will be successful in the classroom? Please keep in mind - this is merely an example of a possible schedule. You will have to come up with something that works for you and your child. It doesn't have to be adhered to rigidly each day. I know it's summertime and there are day trips, vacations, play dates and fun to be had. I'm doing all of those things with my girls to. It's important for children to play and socialize. Just know that it will help your child make the adjustment to being in a structured classroom all day when they begin kindergarten if they have had some experience with following a schedule in their day. School is all about schedules. We follow the same schedules all day, every day, all year. 2. Provide opportunities for social contact with children of the same age. This is a big one! It touches on so many important skills - learning to make friends, working cooperatively with others, taking turns, sharing and figuring out how to regulate their behavior (talking versus hitting, thinking of the feelings of others, etc). Head out on play dates, take a trip to the library during story hour, hit the park on a sunny morning and/or visit a splash pad to beat the heat. While you're out enjoying summer, encourage your child to venture out of their comfort zone and meet a new friend, invite a child to play with them or simply strike up a conversation with a nearby child. Many children do these things on their own but some may need encouragement. It will help them adjust to meeting so many new faces in kindergarten. 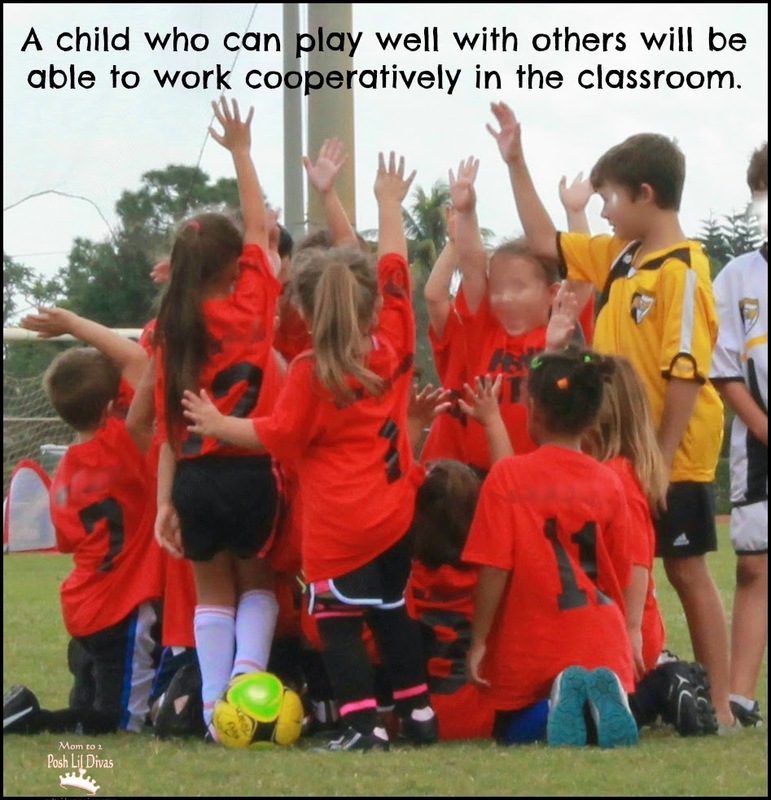 A child who can play well with others will be able to work cooperatively in the classroom. Don't worry if your child appears shy or even anxious at first - it's normal. The more opportunities your provide for them to practice their social skills, the easier it will become for them. Your child's teacher will help the students in his/her care get to know each other over the first few weeks of school. It's always helpful if as parents, we provide them with the tools they need. You are your child's first and most important teacher. Doing these things at home encourages their independence. This is important once your child begins school because we nurture and foster their independence from the beginning. It also encourages a sense of community ownership which is crucial in the classroom. As a kindergarten teacher I quickly establish in my classroom that it will take teamwork to keep things tidy, organized and available for everyone. 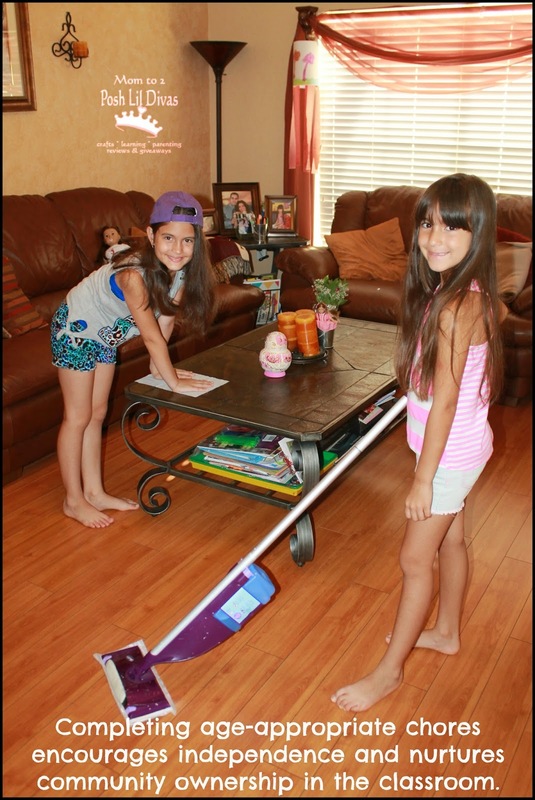 Finally, having and completing chores will help your child be able to follow simple directions in the classroom. A child who is unable to follow directions not only disrupts the overall flow of the classroom but also impedes learning - both their own and the learning of those around them. 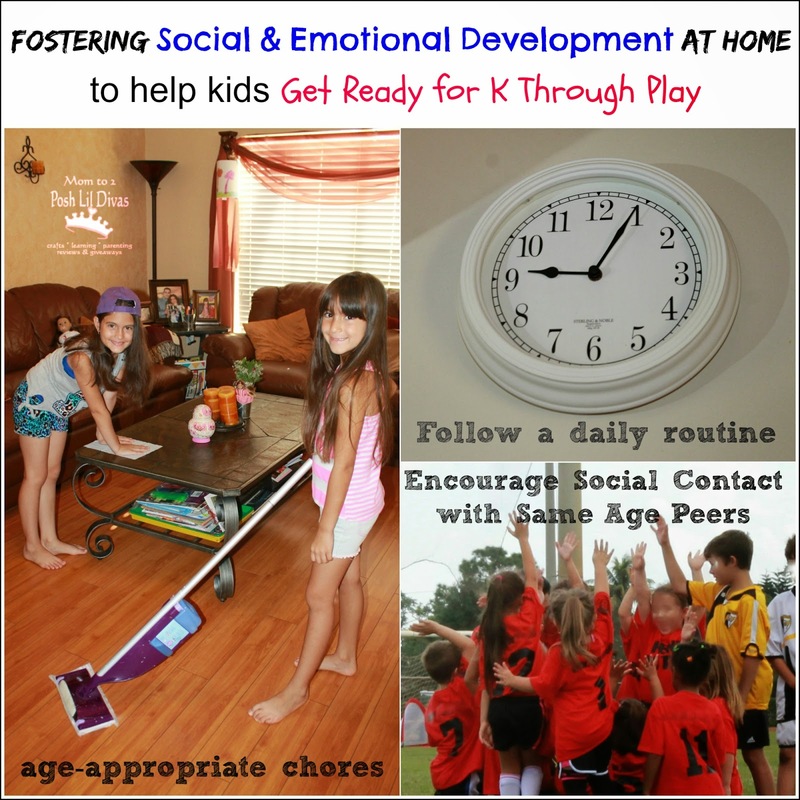 For more info on children and chores read our Wk 3 post - Foster a Child's Independence with Chores at Home. You'd be surprised at how doing these 3 simple things at home will positively impact your child's transition to kindergarten. A child who is socially and emotionally ready for kindergarten = a student who is ready to learn. 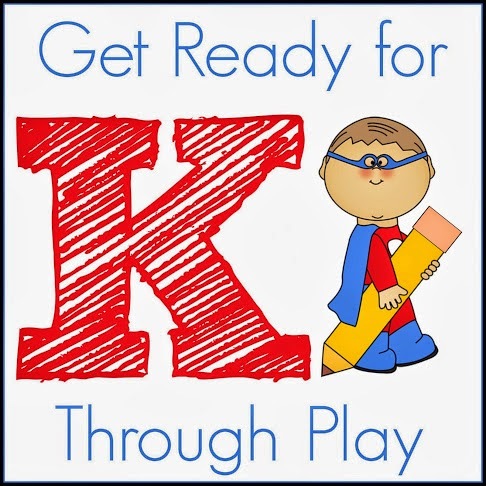 Be sure to follow the Get Ready for K Through Play Pinterest Board for even more ideas from around the web to help you get your child ready for K in playful and easy ways. 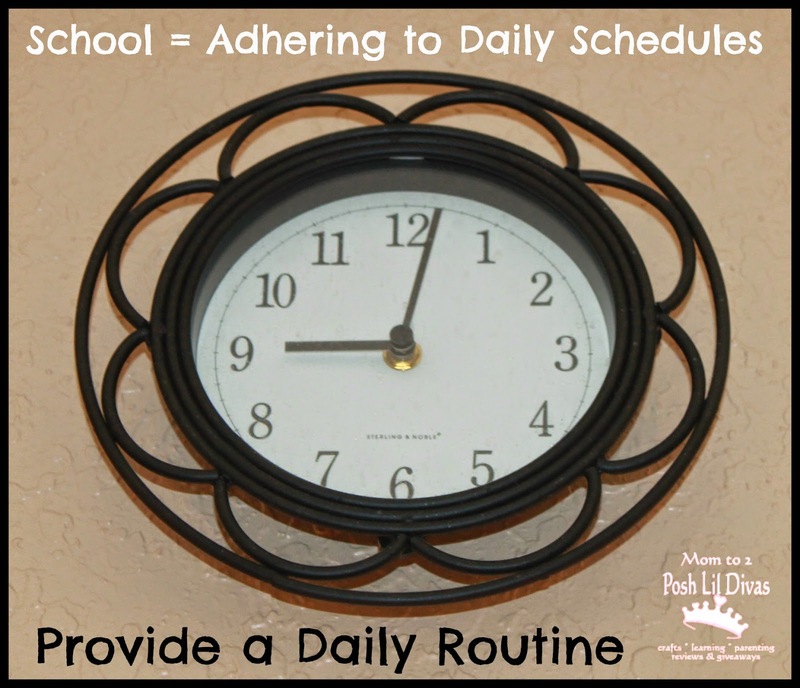 We still keep a schedule during the summer and I agree it helps kids with being able to adjust when school starts. Pinned and stumbled! This is a really thorough and helpful post. I am definitely using these ideas for my son.